In addition to this security experience, the pair also has an excellent track record in breeding, importing and training security dogs for a variety of different services. We provide affordable, high quality security dogs and guards for hire, as well as comprehensive training and dog breeding services. We have a reputation as one of the only full service security companies in Queensland, as well as enjoying the statues of the preferred partner for security services. Queensland Security Solutions has a network of high quality security personnel we work with in Brisbane, the Gold Coast and Ipswich. We also have a catalogue of dogs we have handpicked in order to match the right dog to your security needs. During our many years of experience we have serviced a vast catalogue of clients with a variety of properties and security needs. Our commitment to the high quality service means that each of our clients can enjoy world-class security. We handpick our team and the dogs we work with in order to ensure that our client’s needs are met. We are constantly updating our quality management systems to ensure that we remain at the forefront of security solutions in Australia. Vendo is the manager of Queensland Security Solutions and has over 15 years’ experience in security services and security dog breeding and training. 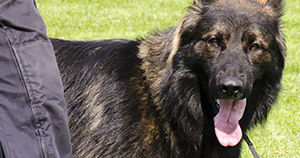 Vendo has had a detailed career in breeding, raising and training security dogs for a number of different security needs and specialist purposes. He also manages K9 Security Services which acts as a complimentary business venture to Queensland Security Solutions. Vendo and the team at Queensland Security Services also have a joint venture in Dogs@Work which enables Vendo and Jan to exercise their skills in security guard and security dog training. Prior to his work providing security solutions Vendo worked in business management for 18 years. His prior experience has enabled him to develop a broad range of skills across business development, marketing, driving growth and a variety of other business related skills. Jan is the Director of Queensland Security Services and has a wealth of experience in security solutions and business management. Jan is a highly experienced educational professional who has over 15 years of experience in both teaching and training. Jan also has a wealth of knowledge in relation to administration and operational requirements which have been demonstrated in the establishment of both Queensland Security Solutions and K9 Training Solutions. Jan also has a strong background in business development, program coordination and working with students of a variety of ages in a number of different training programs. If you would like to learn more about the team at Queensland Security Solutions please contact us today.